Prevent cartilage damage. Glucosamine is the building block of proteoglycan, one of the main structural components of cartilage. Studies show that glucosamine stimulates cartilage cells (chondrocytes) to produce proteoglycans, thus normalizing cartilage metabolism and keeping it healthy. Slow down the breakdown of cartilage Studies have shown that glucosamine may inhibit the activity of enzymes responsible for breakdown of cartilage. Glucosamine may also have anti-inflammatory action. Help build, repair and regenerate cartilage. Studies have shown that glucosamine can stimulate chondrocytes to begin producing healthy new cartilage matrix. Glucosamine has been shown to stimulate the regeneration of experimentally-induced cartilage damage. Reduce pain and immobility. Many studies have shown the effectiveness of glucosamine in relieving pain. 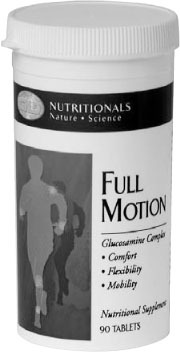 Studies show that joint tenderness and restriction of movement also improve with glucosamine supplementation. Glucosamine is quickly and efficiently absorbed from the intestinal tract and is rapidly incorporated into joint cartilage. Studies using tagged glucosamine to allow scientists to follow the compound through the subject’s bodies, found that glucosamine did indeed travel to the joints and incorporated itself into the cartilage to help stimulate new cartilage growth. 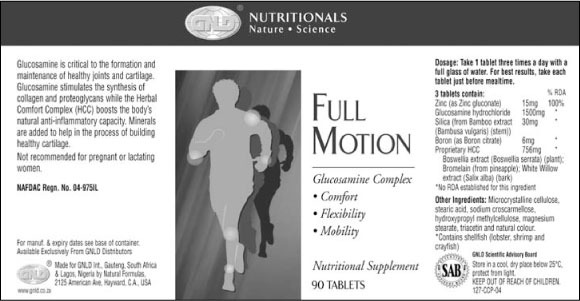 Provides 1500 mg of glucosamine, the dose used in studies shown to reduce pain and stiffness. Pharmaceutically pure, biologically functional glucosamine from Glucosamine Hydrochloride – easy to digest and sulphite-free – minimizing digestive discomfort and allergic reactions. Natural, high-quality source of purified glucosamine. Herbal Comfort Complex, an exclusive blend of Bromelain, White Willow, and Boswellia, ingredients strongly associated with the body’s natural mechanisms for minimizing joint pain and inflammation. Regenerative Mineral Complex, an exclusive blend of synergistically critical Zinc, Boron, and Silica, key minerals for joint health. 3D Advantage, which provides optimal bioavailability through maximum Disintegration, Dissolution, and Dispersion. Formulated under the direction of the SAB using leading edge science.